Please complete the following fields to receive bids from vendors with Saab for sale. To get quotes for used Saab Transmissions, simply fill in and submit the form above. You’ll start receiving quotes from our network of reputable auto parts brokers within minutes. Saab was a Swedish auto manufacturer founded in 1945. The concept behind brand, which was owned by parent company Saab AB, was the production of small cars. General Motors (GM) took 50 percent ownership of Saab in 1989 and acquired the other 50 percent in 2000. By 2012 the brand had changed hands again and filed for bankruptcy. Saab vehicles stopped being produced in 2014. Saab AB still owns the namesake. Saab has a history of thorough testing, and was one of the first auto makers to design cars with safety as a major engineering component. The cars have also set records for speed and endurance. Replacement Saab transmissions are a great way to save money, and now it is easier than ever for drivers to find the right parts for their vehicle. Take advantage of our free used parts locating service that takes the hassle out of finding reliable used Saab transmissions. This service is designed with no obligation in mind. Finding the right part for a car depends on a number of factors, and we make it easy for consumers to locate the model that will fit their vehicle. This form is incredibly easy to fill out, and it only requires the model and make of the vehicle. The entire process takes about 15 seconds or less, and shoppers will be contacted immediately by e-mail or phone. We have an extensive network of automotive recycling facilities that often have products immediately available for shipment. Our services are free for everyone. There are no hidden charges and there is no obligation to accept any of the offers sent to you. Shoppers are only offered a chance to find the right model for their vehicle. This process helps saves time and also ensures that buyers find the part with the best warranty available at the right price. The best thing about the search service is that most shoppers will get multiple responses from a variety of suppliers in our network. This makes it easy to find the right model at the perfect price. Consumers also save time, and they will no longer have to drive to more than one repair shop looking for their next transmission. Shopping for Saab transmissions for sale is easier than ever, and our search site makes it easy for shoppers to get multiple offers. We have an extensive network of suppliers, and most of the products are fully tested, cleaned and ready for shipping. The requests are sent to each member of our team, and shoppers will get multiple responses. The services are completely free, and there is no obligation to buy anything. Shoppers will save time, and they can find the right part without having to leave their home. The services also are designed to make it easy to find any part, and most shoppers can be done with their request in less than 20 seconds. Whether you need a four-speed, manual transmission for your Saab 900 “Classic” or a six-speed, automatic transmission for your second generation Saab 9-3, we’ve got you covered here at ASAP Motors. 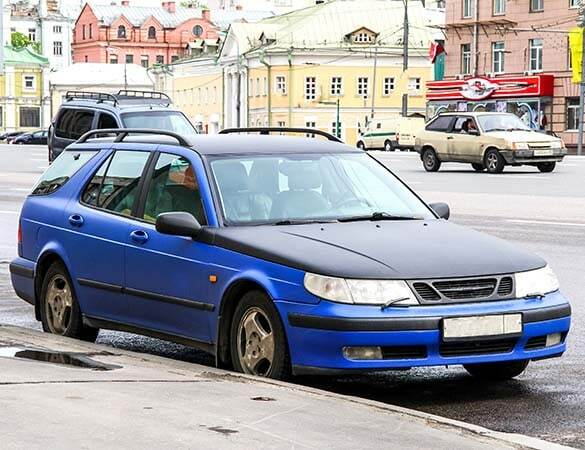 Because the original Saab manufacturer is an aerospace company, Saab cars were historically designed to be aerodynamic. Well-known Saab features include a wrap-around windshield, safety technology and a quirky hatchback body style (on older Saabs). Saab vehicles contained transmissions from a range of manufacturers. Many transmissions came from Saab itself as the original owner and maker of the the brand. Other sources include Aisin and GM. You can find Saab cars with manual and automatic transmissions in three, four, five and six speeds. Q: What are the common signs of a failing transmission? A: If you’re wondering if it’s time to seek a used transmission for your Saab, check for signs like leaking fluid, difficulty shifting from one gear to another, slipping in and out of gears for no reason, delayed or no acceleration and whining/thudding sounds. For Saabs, one common transmission problem is coolant leaking into the transmission fluid through the radiator’s transmission cooler. Keep an eye out for this particular issue. Q: How much does a used Saab transmission cost? A: While the exact price of a used Saab transmission depends on the model and year of the car, most customers pay between $250 and $1,000 for used Saab transmissions. Q: Will my used Saab transmission come with a warranty? A: Possibly. You will not buy a Saab used transmission directly from ASAP Motors, so we cannot guarantee a warranty. However, many of the auto parts brokers we work with do offer warranties, so be sure to ask for all the information and paperwork. The Saab 9-3 was produced from 1998 until 2014. As a compact executive car, it was basically a rebadged Saab 900. Manufactured by GM, Spyker Cars and NEVS (as Saab changed hands over the years), the Saab 9-3 uses four, five and six speeds in both manual and automatic. Certain transmissions were made by Saab and Aisin. The Saab 9-5 was produced from 1997 until 2012. This executive car had two generations, the first being a replacement for the Saab 9000. The second generation was the first Saab vehicle presented under Spyker Cars’ ownership (though it was mainly developed by GM). The Saab 9-5 came in four, five and six speeds in both manual and automatic. The Saab 900 was a compact luxury car produced from 1978 until 1998. The first generation is called “Classic” and the second generation is called “New Generation.” Made as a sedan and hatchback, the Saab 900 was also available as a convertible in the mid 1980s. The Saab 900 uses three, four and five speeds in manual and automatic transmissions.